The Historic Center of Quito, the streets and houses with well-preserved colonial style, squares, churches and museums you will enjoy an unforgettable experience. From the cable car can get a panoramic view of the city. From early on our guide will pick you up at the hotel, to take him to tour the main attractions of the city Quito, our first stop will be at the viewpoint Guápulo, which is one of the most beautiful colonial church built in honor Quito of the Virgin of Guadalupe. It also offers a spectacular view of the avenue of the volcanoes and valleys of Kumbaya, Pifo, Tumbaco and Yaruqui. Continue until the Church of the Basilica del Voto Nacional, which was built in honor of the consecration of the State to the Sacred Heart of Jesus. Inside are 24 chapels, one for each province in Ecuador. 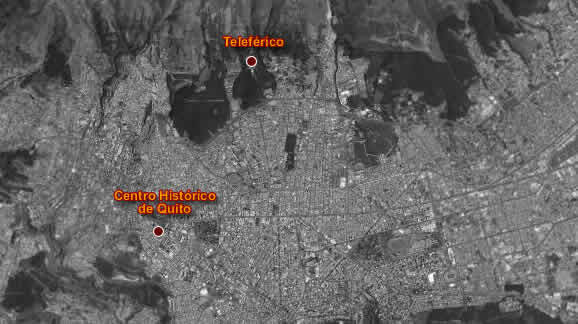 Then we will go to the viewpoint of San Juan where we can appreciate a beautiful view of Colonial Quito. We continue to the Plaza de la Independencia in the streets of the colonial area, surrounded by the Cathedral, Presidential Palace, the Municipality and the Archbishop's Palace. 'll Visit the Church of the Society of Jesus and his wonderful golden interior. The tour includes a visit to the San Francisco Monastery built in the seventeenth century, one of the main religious monuments of the new world, here you can see its impressive façade and atrium and its baroque interior influenced by the Moorish style, with the winged Virgin of Quito at its altar. Also visit the major museums of the city, where we will observe the jewelry, handicrafts and gold objects from the pre-Inca and Inca Ecuador. We continue our visit to the hill of Bread, with three thousand meters above sea level, famous for its beauty and its legacy of the time. Here you can enjoy an incomparable view of the Historic Center. Finally, pay a visit to Quito's cable car, take a gondola and climb to an altitude of 4100 meters of Cruz Loma area, where you can view a spectacular image of the city of Quito. Warm clothing and light clothing, sunscreen, sunglasses, camera, binoculars and good walking shoes.